The finest "Spanish Style" tomato sauce, and with zesty, hot chili added to enhance your special meal preparations! Faraon Hot Chili Tomato Sauce can be used any time, as a replacement for your regular tomato sauce. 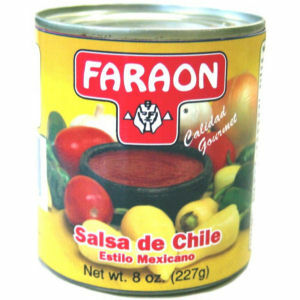 Faraon will greatly enhance your tacos, enchiladas and will give your home made salsa the extra tomato body it needs. Enjoy!